No tricks. No false trails. Well ofcourse there are a few 'false trails' it's a maze! But no Red Herrings and any switch you need is on the level you are on. Probably you shouldn't set the self destruct until clearing the maze. 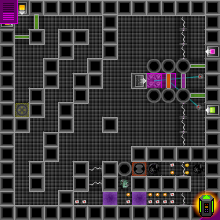 The maze has 2 proper levels 1 and 4 and 2 'filler' levels comprising of next to nothing just to give the switches a chance to reset as you leave Lvl 1 and head for the end i.e. Lvl 4. You still reading this? Play it already.